Generic Fantasy Sword. Card Artwork. Equipment Class: Epic Weapon...made by you. The Generic looking Fantasy Sword is essentially the most powerful around, as is every other sword found in the role-playing genre. to save you the trouble of having to complete several life-threatening, albeit trivial tasks, we give you one, (ONE! 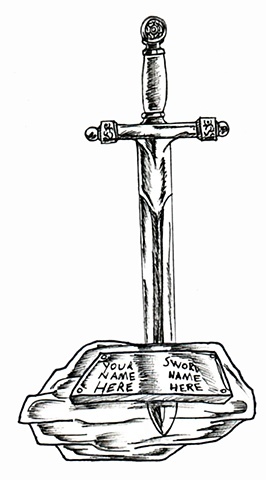 ), sword style, set in stone for that epic removal or receiving moment, along with a dual nameplate in inscribe both you and your legendary sword's name so that it will live on through the ages. I used the Legendary Holy Sword Excalibur as a reference, plus the Sword in the Stone idea is something that I couldn't resist playing with.